Glow Tonic: If there is one word that I would associate with Pixi, it's glow. The other word that I would associate with it is affordable - in my experience, all of the products I have tried are high end quality but with a mid-range price tag. Glow Tonic was the first product that I tried from Pixi around 3/4 years ago and it has been a staple in my routine ever since. Formulated with 5% Glycolic Acid, which is an AHA derived from sugar cane, combined with aloe and witch hazel, this toner is gentle enough to be used on a daily basis, yet effective enough to keep congestion at bay. With daily use, my skin feels soft and smooth with refined pores and looks brighter. A must have for everyone! Glow Peel Pads: These pads are stronger than Glow Tonic as they contain 20% Glycolic Acid so I personally wouldn't use them on a daily basis and I prefer to use them at night. Although the AHA % is high, my sensitive skin isn't left red or irritated due to the inclusion of aloe vera and Vitamin E. My skin always looks really clear and glowing when I use these on a regular basis. When using acids and peels, it's very important to be vigilant with SPF as they make the skin more sensitive to sunlight. Glow Mud Mask: The third product from the 'glow' line that I love is this mud mask. Whilst I sometimes find mud masks to be quite drying on the skin, this one actually feels hydrating. I apply a layer over cleansed skin, leave for around 15-20 minutes and when I remove it, the result is deeply cleansed, even, glowing skin. This is ideal for when skin is congested or around that certain time of the month to keep blemishes at bay! Hydrating Milky Mist: I love a good face mist but some are 'Princess products' - a fancy extra - not this one though! This mist actually adds some moisture to the skin so it is ideal to use after acid toning or even just throughout the day to hydrate and refresh the skin - it would be an ideal desk companion in an air-conditioned office! Rose Oil Blend: One of my favourite discoveries last year! This is a lightweight oil but it really nourishes the skin. It contains a blend of jojoba, sweet almond, pomegranate seed, rosehip and rose geranium oils, all of which combine to deliver a hefty dose of moisture to the skin, without leaving it feeling greasy and of course, it smells beautiful! It's one of my favourite ever oils! There are a few other products that almost made the top five but I had to be very focused when narrowing it down and these are the ones that really give me that glow I crave! 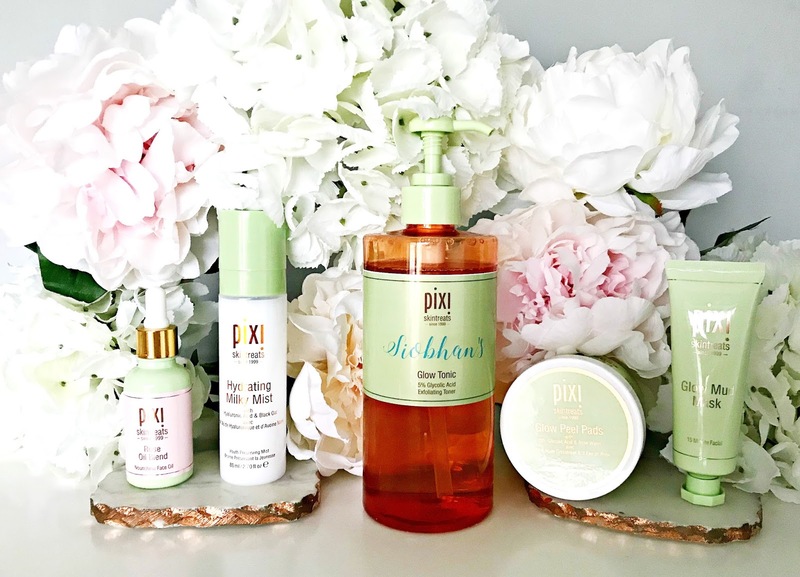 I'd love to hear what your favourite Pixi skincare products are? All available from Cult Beauty with free shipping worldwide for the month of April!